Front wheel also available with mono hub. Rim base en spokes: carbon. Combines perfect with 3-spoke (26"or 28") HED wheels! The 20 inch front wheel also combines perfectly with the three-spoke 26 inch carbon rear wheel! 20 inch (ETRTO 451 mm) disk wheels in carbon. 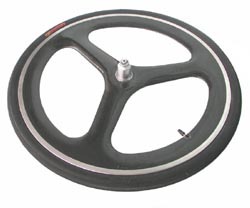 Front wheel is equipped with a mono hub, rear wheel is supported at both sides. 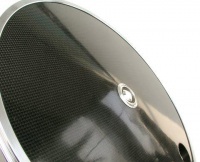 We offer the complete product line HED aero wheels. Please contact us for further information on options and sizes.